ab25333 reacts specifically with a non-polymorphic I-A-encoded epitope on MHC Class II antigens. Our Abpromise guarantee covers the use of ab25333 in the following tested applications. ab25333 staining MHC Class II in mouse spleen, white pulp tissue sections by Immunohistochemistry (IHC-P - paraformaldehyde-fixed, paraffin-embedded sections). Tissue was fixed with paraformaldehyde, permeabilized with 0.1% Tween-20 in PBS and blocked with 1% BSA for 40 minutes at room temperature; antigen retrieval was by heat mediation in citrate buffer pH 6. Samples were incubated with primary antibody (1/150 in TBS + 1% BSA) for 18 hours at 4°C. A Biotin-conjugated goat anti-rat IgG polyclonal (1/100) was used as the secondary antibody. Flow Cytometry analysis of BALB/c mouse splenocytes labeling MHC Class II with ab25333 at 1 μg/106 cells (purple). A Mouse Anti-Rat IgG2b-AF488 was used as the secondary antibody. Grey - Isotype Control, Rat IgG2b-UNLB, followed by Mouse Anti-Rat IgG2b-AF488. 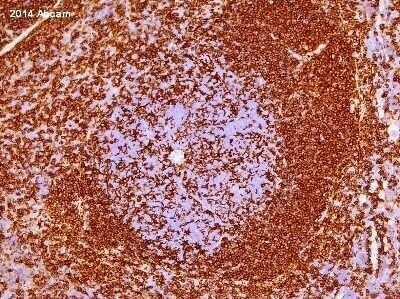 ICC/IF image of ab25333 stained Raw264.7 cells. The cells were 4% Formaldehyde fixed (10 min) and then incubated in 1%BSA / 10% normal Goat serum / 0.3M glycine in 0.1% PBS-Tween for 1h to permeabilise the cells and block non-specific protein-protein interactions. The cells were then incubated with the antibody (ab25333, 10µg/ml) overnight at +4°C. The secondary antibody (green) was ab98420, DyLight® 488 Goat anti-Rat IgG (H+L) used at a 1/250 dilution for 1h. Alexa Fluor® 594 WGA was used to label plasma membranes (red) at a 1/200 dilution for 1h. DAPI was used to stain the cell nuclei (blue) at a concentration of 1.43µM. Acetone fixed Mouse LLC tumour tissue stained for MHC Class II using ab25333 at 1/150 dilution in immunohistochemical analysis. The tissue was incubated for 18 hours at 4°C and blocked using BSA for 1 hour at room temperature. Alexa Fluor® 488 Goat Anti-Rat IgG (H+L) Antibody was used as the secondary at 1/100 dilution (green).